ScootPad Apps Now Available for iPads, Androids, Nexus, Kindle Fire and more! 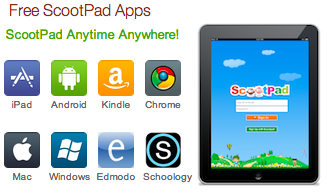 Milpitas, CA – Sep 3, 2012 – ScootPad, a leading personalized learning platform, today announced the availability of its FREE ScootPad App on all major tablets. ScootPad Apps is now available on all popular tablets including iPad, Android tablets, Google Nexus and Kindle Fire. ScootPad App is FREE and comes loaded with all features for students, teachers and parents.